Recently, we had a post discussing the sobering results of Distil Network‘s survey on how publishers are coping with bad bots and how big of a threat digital ad fraud will be in the next 12 months and more. Today, we equip you with a downloadable chapter extract from FIPP’s Innovation in Magazine Media 2015-2016 World Report. The industry will never be able get rid of fraud outright, I think. But that does not mean nothing can be done. Publishers can secure their digital ad operations by giving enough attention around brand safety, ad viewability and all the aspects of fighting against nonhuman traffic and ad fraud. 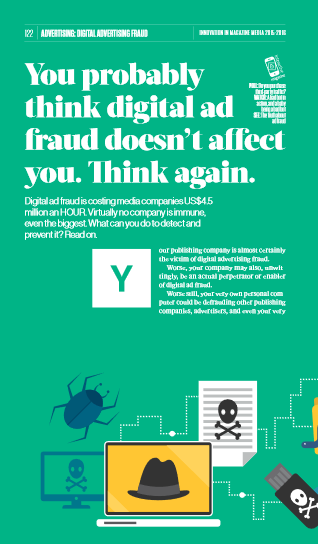 Arm yourself with knowledge and information, click the image on this post to view or download the report’s chapter extract on Digital Ad Fraud. And if you want to learn further, you may wish to order FIPP’s full report of Innovation in Magazine Media 2015-2016. Take a tour of the innovations that can have the biggest, most immediate impact on the future of magazine media, see more details here. Realview’s stringent procedures and proactive approach help protect the security of our clients’ digital publishing experience. We build security into the solutions we offer and continuously hold internal sessions to update ourselves and understand the latest security best practices to further equip our clients. Contact us and let’s sit down to discuss your concerns!